NEWSFLASH!! Palestinian prisoners just ended their mass, open-ended hunger strike after they managed to force the Israeli Prison Service to install landlines in prisons which will allow them to speak with their families. This is an unprecedented win for the hunger strikers. Palestinians and their supporters around the globe mark April 17 every year as a day of solidarity with the Palestinian political prisoners in Israeli jails. The PLO’s Palestinian National Council (PNC) chose this date to recall the release on April 17, 1974 of Mahmoud Bakir Hijazi, the first Palestinian prisoner to be held in Israeli jails. The PNC hoped that the commemoration would send a message of hope, solidarity, and freedom to all Palestinians behind bars in Israel: just as Hijazi was released in 1974, there will come a day when all Palestinian political prisoners will be released. Palestinians who have spent decades in Israeli jails– like Nael Barghouthi, who has spent 39 years inside– send the rest of us messages that indeed they dream of tomorrow and that the walls of their prisons will one day collapse. This year has seen the Israeli Prison Service (IPS) taking unprecedented measures against Palestinian prisoners, including the installation of devices to intercept and prevent Palestinians from making phone calls to their families using smuggled phones. direct contact with child prisoners in Israeli jails to help them go through this difficult experience. Israel has refused so far to meet the demands of prisoners, so the strike is still going on, putting the lives of hundreds of Palestinian prisoners at risk. In addition to smuggling a small number of phones into their prisons, Palestinian prisoners have smuggled their sperm out of prison so they could have children (even if these children will most likely will grow up deprived of their fathers’ presence.) Some Palestinian prisoners have smuggled out their writings, too, using capsules. And they have tried many times to break their chains and leave their cells for the outside world– as the famed prisoner Hamza Younis did, managing to escape from Israeli jails three times over. The previous experiences of the Palestinian prisoners made them very careful when negotiating with the IPS. In one of the hunger-strikes, prisoners wanted to have access to TV–which they achieved at the end of a mass, open-ended, hunger strike. Yet the IPS was so literal: it allowed the TVs in but without any TV channels, as this was not written in the agreement! 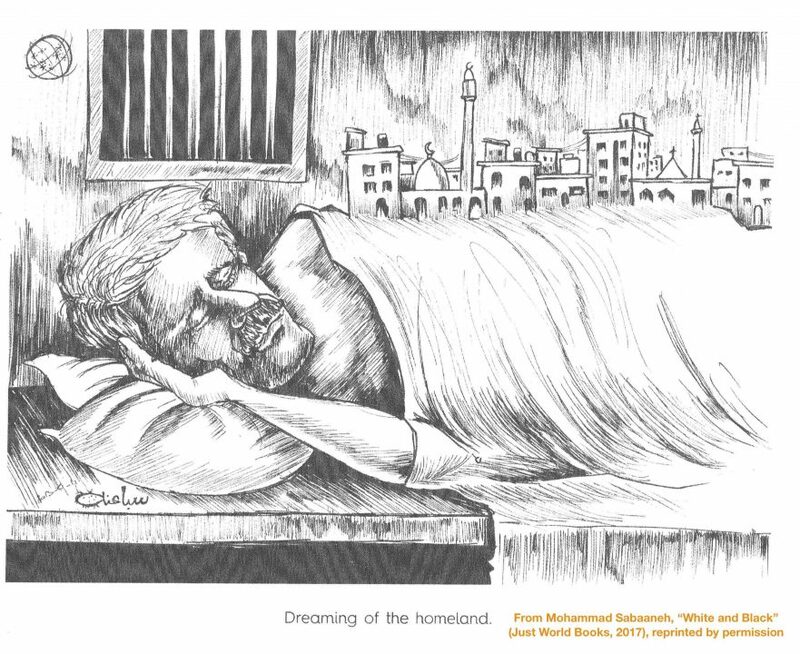 In 2012, the prisoner Hana Shalabi was taken to a hospital in Haifa after engaging in a hunger strike. Once there, her feet were tied to her hospital bed and her hands were in shackles. But despite her pain, she smiled at her jailer, telling him that the IPS helped her realize one of her dreams: to be in Haifa, where her family came from, before they were kicked out to Jenin in the West Bank. The IPS immediately ordered that she be transferred to another hospital in a different city. Her memories of her village near Haifa, which was ethnically cleansed by Israel in 1948, terrified them. The family of the Palestinian child prisoner and martyr Ayman al-Abbasi also have a strong memory—in this case, of the day that he was killed by Israeli forces in Jerusalem just after being released from Israeli jails. Ayman was shot dead while taking part in the popular protests in 2015 in Jerusalem, which were known as the Jerusalem Intifada. After he was killed, mourners had to rush his body to the nearby graveyard to bury him even before his mother could bid him any last farewell, lest the Israeli forces kidnap his body and God knows when they would return it back, if they ever would. Israel should forever be ashamed of detaining children as young as four years old to satisfy its lust for Palestinian blood and life at the expense of a whole captive population. Over the 52 years since 1967 Israel has arrested over one million Palestinians, which amounts to approximately one-fourth of the Palestinian population in the West Bank and the Gaza Strip. These arrests started immediately after the Israeli military invaded the Gaza Strip and the West Bank in 1967. My grandfather from my mother’s side, Ismail Aljamal, had strong memories of his time in Israel’s prisons, too. He spent six years in Israeli jails from 1972-78 for his nationalism and participating in armed resistance to the Israeli occupation. All that the prisoners wanted was to end Israel’s occupation and to live in freedom. But in Israel’s eyes, they asked for too much, and therefore they deserved to be thrown in jails forever. Yousef M. Aljamal is a Palestinian who grew up in Al-Nuseirat refugee camp in the Gaza Strip. He is a PhD candidate at the Middle East Institute at Sakarya University in Turkey.